A Rohingya refugee child is administered an oral polio vaccine at an immunization centre in Bormapara makeshift settlement, Cox's Bazar district, Bangladesh, Thursday 21 December 2017. Renewed efforts are underway in Bangladesh to protect nearly one million Myanmar refugees from cholera, amid a warning from the UN health agency on Tuesday that “we’re not out of the woods yet”. Dr. Richard Brennan, Director of Emergency Operations at the World Health Organization, (WHO), issued the warning in Geneva, citing risks from other diseases, natural hazards and a serious funding shortage. “We’re not out of the woods yet,” he told journalists, adding that the majority of the Rohingya refugees in Bangladesh live in “overcrowded…unsanitary camps”. “We are looking down the barrel of the monsoon season with the inherent risk of flooding, landslides, as well as the cyclone season,” he added. The refugee crisis started at the end of August last year when more than 670,000 people fled a military campaign in Myanmar’s Rakhine State over the ensuing months, seeking shelter in neighbouring Bangladesh. 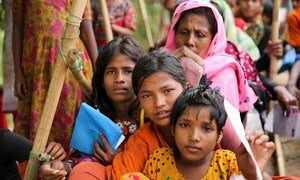 There are now nearly 900,000 displaced individuals living in a dozen camps in and around the border town of Cox’s Bazar, and WHO’s Dr. Brennan said it was a “major achievement” that mortality rates had remained low. The cholera vaccination campaign is a vital follow-up to an earlier inoculation drive in October and November last year. The disease causes acute watery diarrhoea which can be fatal if left untreated. Despite the threat, however, cholera is “only one health concern among a number of priorities”, the WHO official said, stressing the need to focus on water and sanitation facilities as the most effective guarantee against other water-borne diseases. The senior WHO medic also cited serious funding shortages which risked undermining efforts to protect already vulnerable Rohingya communities who had fled Myanmar with nothing, and suffered a litany of reported human rights abuses. Some $950 million is required to help the refugees, Dr. Brennan said, but only around 16 per cent of this amount has been provided. Resources are even more scarce when it comes to healthcare, with only 6.3 per cent of funding needs met. As refugees continue to arrive in Bangladesh from Myanmar, the WHO official repeated the core UN demand that any future return of mainly-Muslim Rohingya communities would have to be “safe, voluntary and dignified”. 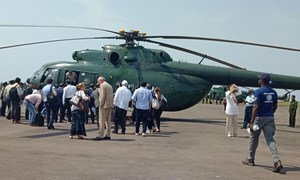 Concerns remain about the poor state of health services in Myanmar’s Rakhine State where the UN health agency has limited access providing disease surveillance, training, mobile clinics and medical supplies.